The VA Palo Alto Health Care System (VAPAHCS) has made it a priority to ensure that all women Veterans receive equitable, high-quality, and comprehensive health care services. For more information, select one of the centers/programs below. The Women's Health Center provides specialty medical services for the health care needs of Women Veterans within VAPAHCS. The Women's Counseling Center provides outpatient services dedicated to the emotional health and well-being of Women Veterans. This center was designed to meet the needs of the growing female Veteran population within VAPAHCS. The Women's Trauma Recovery Program provides specialty residential treatment for military women with post-traumatic stress disorder (PTSD). It is the first and longest standing program of its kind and is open to women across the country. In Vitro Fertilization (IVF) Treatment: IVF evaluation and treatment to Veterans with service-connected conditions that resulted in infertility are available to Veterans and their spouses. The benefit was added to existing infertility services. As part of our effort to educate Women Veterans about the Veterans Choice Program, VA created a Veterans Choice Program Toolkit. The full toolkit can be found at www.va.gov/opa/toolkit. Women’s Health Services recently released two free mobile applications (apps) for VA and non-VA care team members, the Caring4Women Veterans and Preconception Care apps. 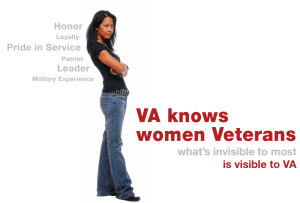 Both apps provide important guidance in caring for and counseling women Veterans. Download links are provided below.